* What makes a custom bike better than a production bike? I’m not going to tell you that a production bike is bad. It’s not. But it wasn’t made for you. Production bikes are made for averages and assumptions, and fit a mainstream aesthetic. That usually means a certain weight distribution assuming a particular average rider morphology, with handling geared towards feeling like a race bike. And if all you do is standard American industrial park criterium riding, that may be just fine. I find that most riders don’t do that. And aren’t exactly “average”. Custom bikes, and especially Mjolnir Cycles bikes, are made for the rider and how they ride. Not some assumed bell curve. * Why fillet brazed steel? I’ve ridden frames of all the materials and construction methods on the market. I have titanium and aluminum bikes in my personal quiver of rides. But my most-ridden go-to bikes all have one thing in common: fillet brazed steel frames. The whole “steel is real” catch phrase doesn’t really convey the idea well — steel is the best material for weight, price, construction and repairability. Fillet brazing releases the builder from the confines of pre-determined frame angles and tube diameters, allowing better tuning of ride characteristics. It also delivers a more organic look, a sense of blending the tubes together. As the frame blends together, so also the bike blends with the rider. On the home page, it opens with the question “Are you worthy to take up the hammer?” That funny decal is the runic spelling of the Norwegian word “verdig”, which means worthy. It’s there to remind you, when you’re ready to hang your head in defeat, that YOU ARE WORTHY! Of the ride, of the battle. It may just be the mental nudge that keeps you in the fight. That symbol is an expression of homage to my family, my heritage, and my beliefs. 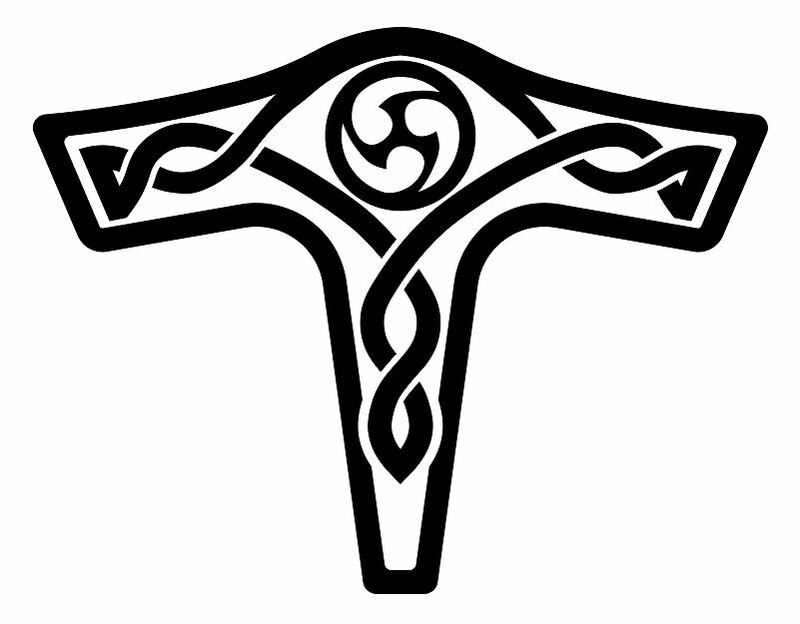 It is a Celtic symbol for Thor’s hammer, Mjolnir (homage to my Norwegian heritage), inverted so that it forms a T (my last name), with a blade triskele in the center, which symbolizes a warrior for the trinity. * How long until I get my bike frame? I don’t have a set flow-time for producing a frame. This isn’t my full-time gig, so some of it depends on the time I have available to me, and the length of the current build queue. Updates will be provided to you as progress is made, so you’ll know where it is in the build process. * What kind of warranty? I stand behind every Mjolnir Cycles bike frame for the original owner, 100%. If there is ever a problem, I will make it right. But please be aware that steel frames, especially those made from light tubing, do require some maintenance to remain sound. Take care of the bike, and it will last. Neglect it, and I may repair it at your cost. * How much is the deposit on a frame? When do I need to pay? Once the design is settled and the final price is agreed, a 50% deposit is required before I begin fabrication. See the Ordering page for details. * You mean you don’t take money until the design is done and agreed on? Yep. Maybe I’m giving away the farm on this one, but I don’t believe in taking any money until I know exactly what I’m building and it’s all priced out. I don’t want to deal with returning money to people who paid for a place in line, and later decide they want to go another route. * Can I get a complete bike, or just a frame? Yes. Either one — I have full facilities to build up a complete bike, and can source most build kits. You can also supply the parts. Two caveats here: (1) I will require a 100% deposit on all parts I source (but, trust me, you won’t get gouged on the component prices — I don’t charge retail, so I’m constrained by my suppliers to not advertise my prices), and (2) Any parts you supply will need to be in my hands before frame fabrication. Why do I need to have those parts in hand to build the frame? There are variations in things like crank-arm Q-factor and brake caliper clearances that need to be taken into consideration. * What tubing do you use? Some frame builders like to stay with one particular brand/type of tubing — True Temper (recently ceased bicycle tube production), Columbus, Reynolds. etc. I don’t subscribe to any one particular tubeset, nor do I stick to any one type of tube even on a single frame. I use the best tube for the application, regardless of brand or number. If you need to have your frame be Reynolds 853 or Columbus Zona throughout, then I’m not your guy. And that’s totally okay with me. Would you go into a fine restaurant and tell the chef what ingredients need to go into your meal? You won’t get a tubeset brand sticker on a Mjolnir Cycles frame, because your frame is not made from any one particular type of tube. * How much do the frames weigh? I’ve never weighed a frame out of my production, and likely never will. I make the frames to suit the rider, the intended use, and the desired feel. I don’t embellish them with needless decoration, and I don’t go to ultra-thin tubes to chase some arbitrarily gossamer feel when hefting the bike off the ground. Picking a bike up and feeling its weight says NOTHING about its quality or ride. My frames weigh as much as they need to, and no more. If you’re a weight weenie type that is driven to chase out the last gram, regardless of how it affects the life of the bike, I’m not your guy. I’m okay with that. * Do you make a women’s-specific bike? No. Yes. Maybe. Are you a woman? If so, then the bike I make for you is woman-specific. I make a bike specific to the rider, regardless of gender. Clear enough?